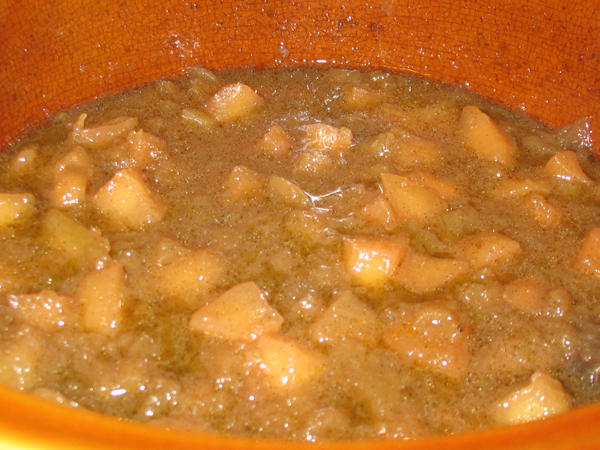 Imagine a warm bowl of apple sauce, with chunks of apple and pear, spiced with cinnamon, cloves, and vanilla bean. 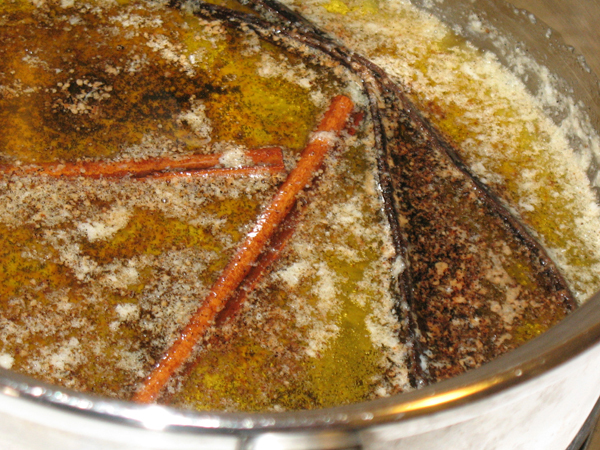 While it’s cooking, the most tantalizing smell will have you finding excuses to linger in the kitchen. 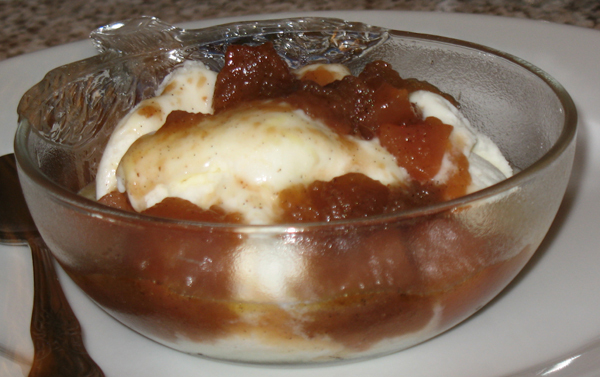 A sweet topping so warm that it melts the frozen yogurt underneath. I found this recipe in a book that my mother gave me, Slow Cooker Magic in Minutes, which is available on Amazon.com and Amazon.ca. It’s a hard cover book with a ring binding and colour photos, with lots of different slow cooker recipes, including some delicious desserts. Prior to reading this I was not aware you could make a dessert in a crock pot. I thought the idea was a little odd, actually, before I tried one. 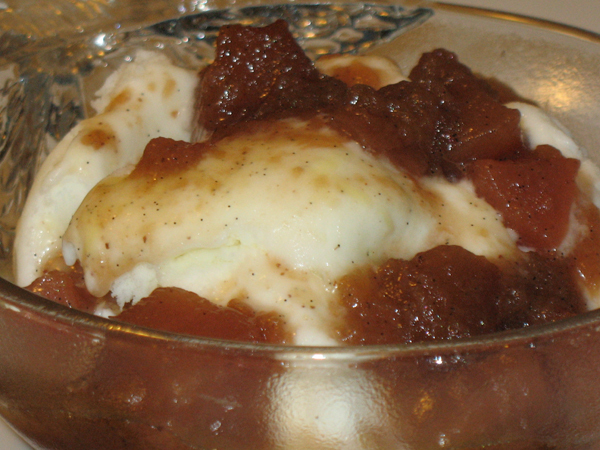 Turns out that slow cooked desserts are amazing! 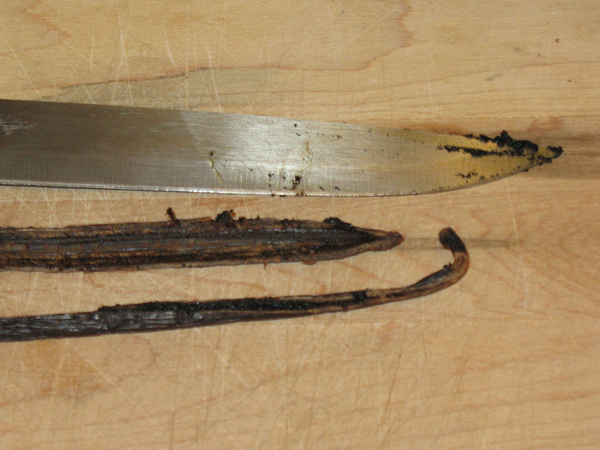 Sometimes vanilla bean can be substituted with vanilla extract. This is not one of those times. Get the bean! Your taste buds will thank you. After this has finished cooking and you’ve had a bowl, the rest should be covered and refrigerated. Later you’ll notice that fat rises to the surface (just like stew). Skim that off, and heat the portion that you want to serve. 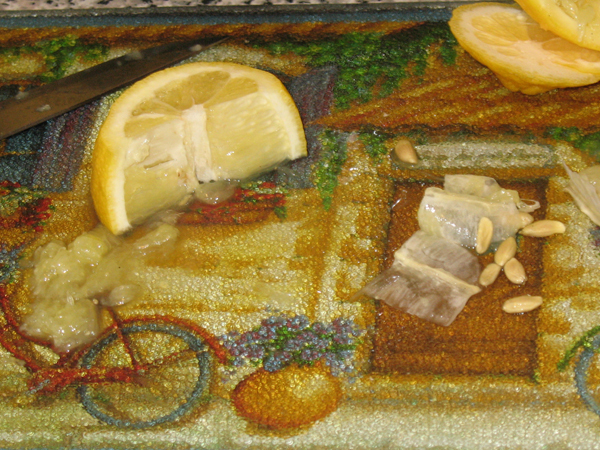 Don’t use over ripened fruit unless you enjoy the feeling of something disintegrating in your hands. 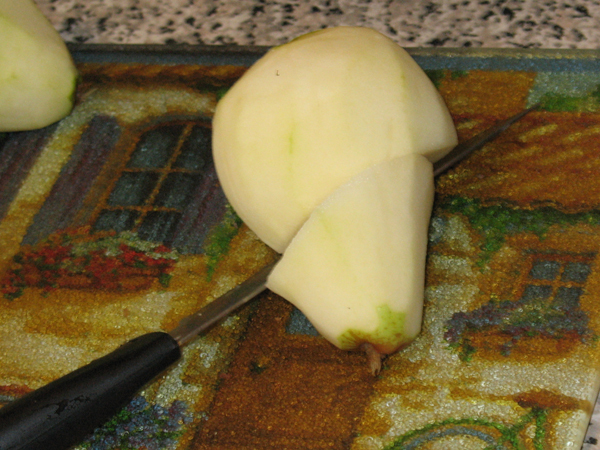 On that same note, if your pears are not quite ripe that is okay, wooden pears are fine for this. Use either 6 medium-sized fruits or 5 large ones. 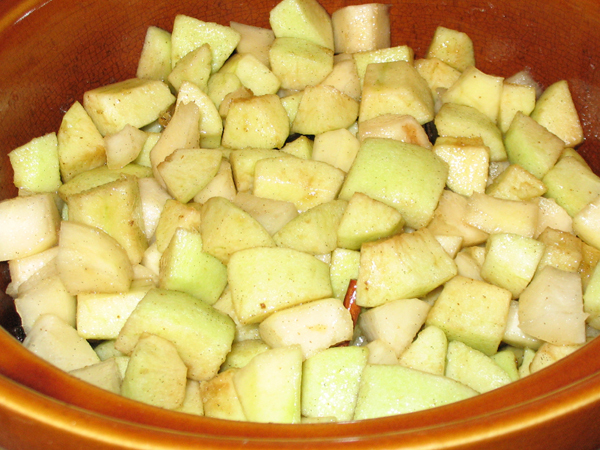 Step 1 – Peel and core apples and pears. 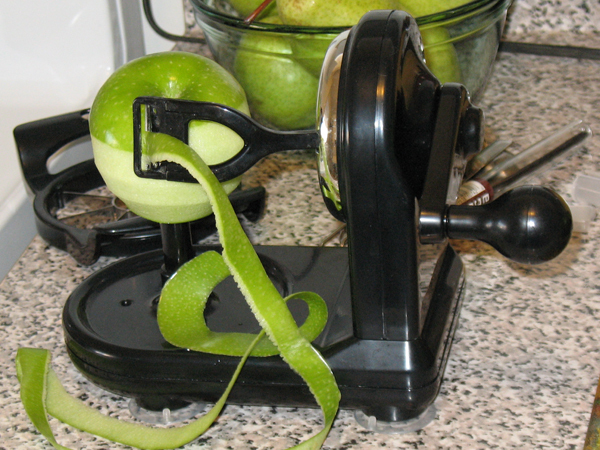 Cut each apple slice in thirds, cut each pear slice in half. Place in slow cooker. 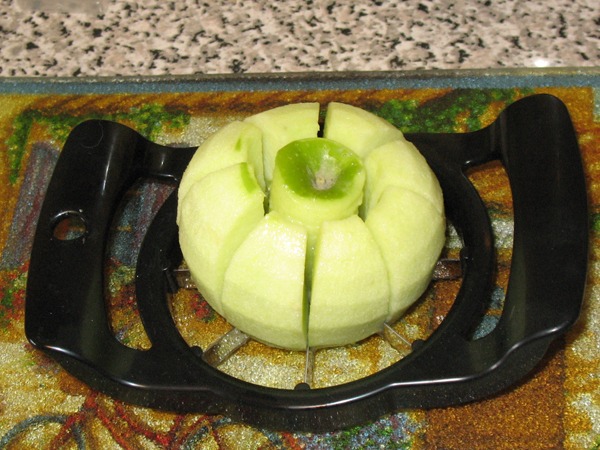 Don’t worry about the fruit browning. 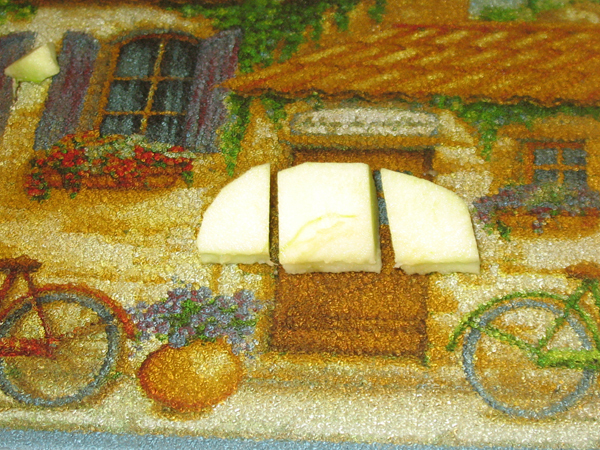 Step 2 – Melt butter in sauce pan on Low. 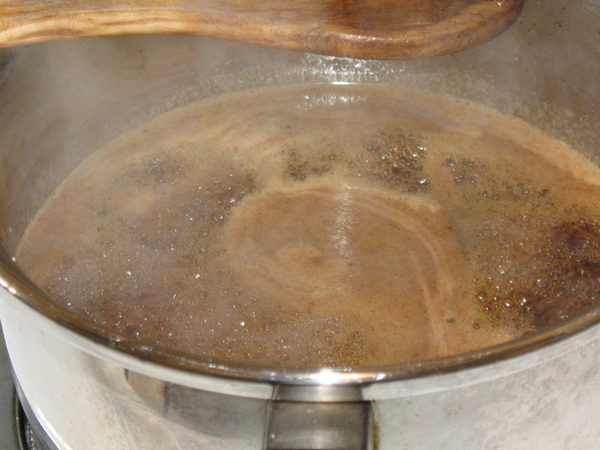 Step 4 – Bring pot to a boil, and boil for 1 min, stirring often. 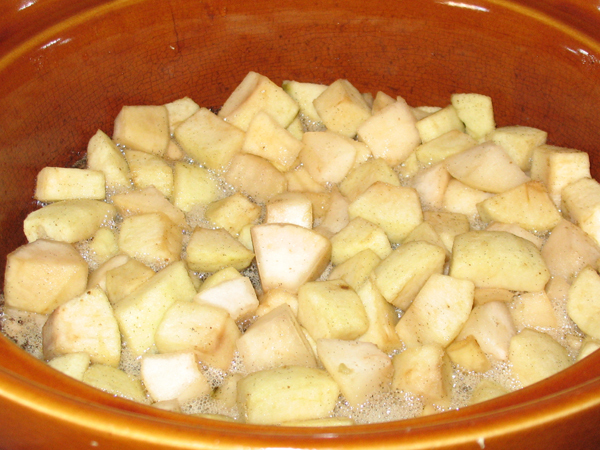 Step 5 – Pour liquid over apple and pears. Stir until mixture coats all fruit. 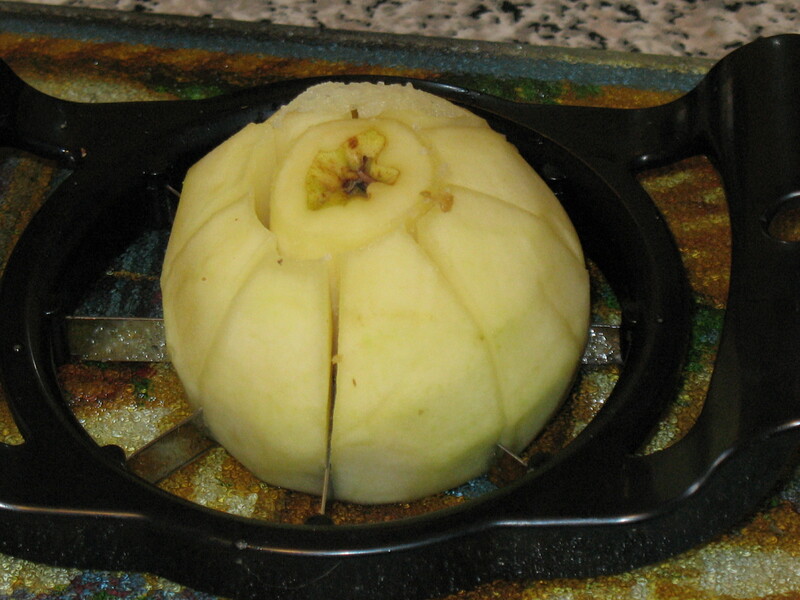 Bury the bean pod and cinnamon sticks under the fruit. 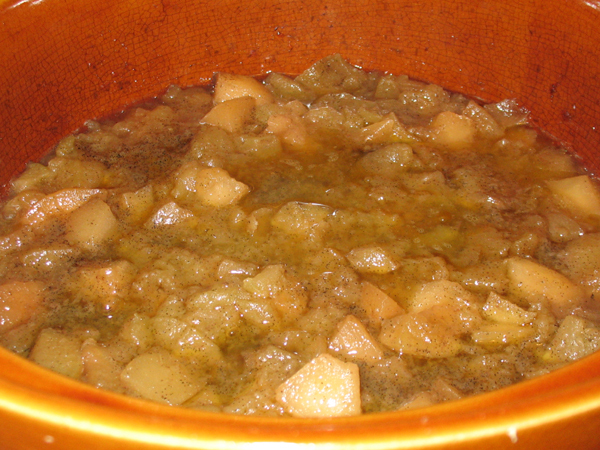 Step 6 – Cover and cook, stirring every 45 min. Cook times vary. The book recommends either up to 4 hours on Low, or up to 2 hours on High. I cook it at leat 5 hours on High and I’ll show you why. I think it’s best when the fruit has broken down to this stage and everything is soft. It’s a very versatile dessert. I have enjoyed it several ways; served warm on its own, or on top of a bowl or vanilla frozen yogurt, and on pound cake. The book also recommends with whipped cream, crème anglaise, or sponge cake, but I haven’t tried these last three. 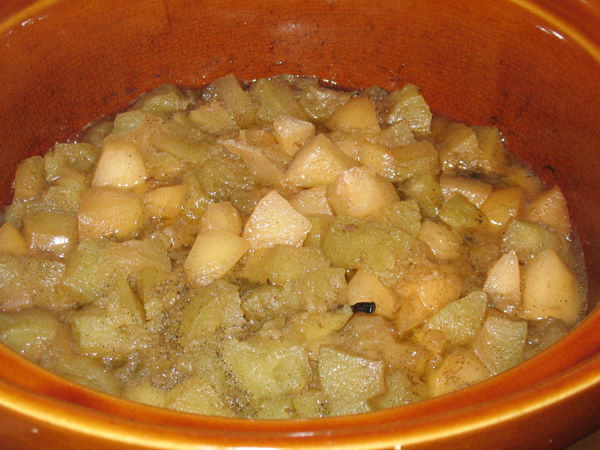 One dish of spiced apple pears a day keeps the winter chill away! 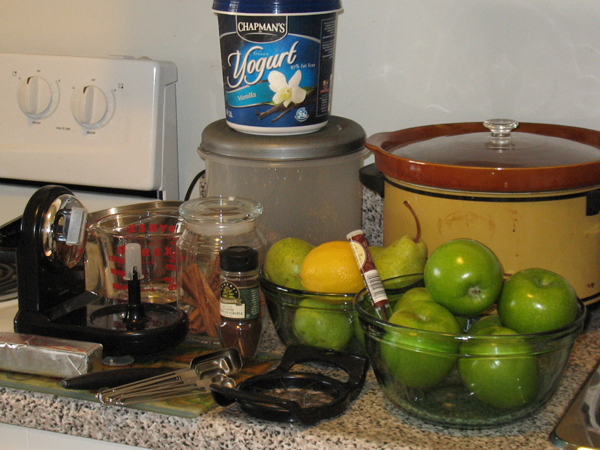 This entry was posted in dessert toppings and tagged apples, cinnamon, cloves, frozen yogurt, lemon, pears, slow cooker.